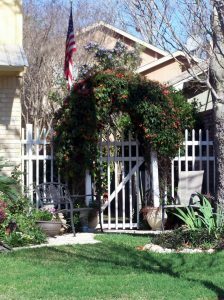 So – anyway, it's clear that spring has come early to the San Antonio metropolitan area: we started early vegetables in pots and planters a month ago ... and by the last week in February, the mountain laurel trees were in full bloom. 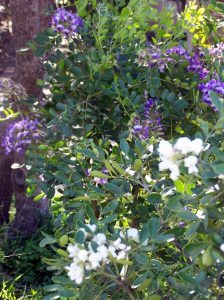 Mountain laurels – those are the mid-sized shrubs and small trees with dark green leaves and clusters of purple flowers that smell like grape soda. 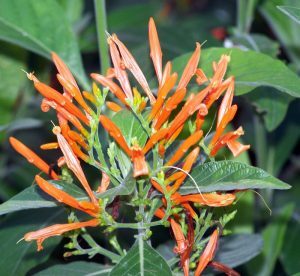 In the fall, the flowers produce long seed-pods full of hard bright orange seeds about the size of peas. In the old days, I am told that people used to drill them through and string them on heavy thread to make bright Christmas garlands. The leggy kerria japonica shrub by the side gate has been blooming frantically this week, and around our neighborhood, the iris and roses are in fine fettle. The rain has been good for the lawns – even the most neglected of them is now lush and green ... with ragweed and dandelions. 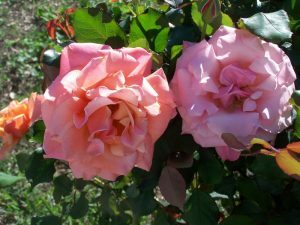 There are maybe four or five lawns in the neighborhood whose owners nailed their banner to the mast and kept green, all last year; now, they look even better than ever, and the best of them look like something on the front cover of Country Living. On another note, what a wondrous thing is the internationalization of taste: things like sushi and tapas and quiche are now such common fare as the ordinary neighborhood HEB now stocks them. Things that one used to read about in accounts of exotic foreign travel can be sampled every day. This weekend, we were hungry for a small bite of lunch – nothing too heavy, more of a snack, really – and my daughter spotted a place called "Tiger Pop", out near the Emerald Forest Subdivision by the Starbucks at 1604 and Bulverde Road – the sign on the side of the building also said "Korean Roll" so I logically assumed that they must be doing something like Korean-style fast food, as there is a Korean version of a sushi roll called 'kimbap' – which has rice in a nori wrapping. You're only middle-aged once, so we went in. The place is very new, squeaky-clean and set up like your average chain fast-food place, and the food is indeed very fast, but it's nothing like the McDonalds (which is just across the parking lot.) 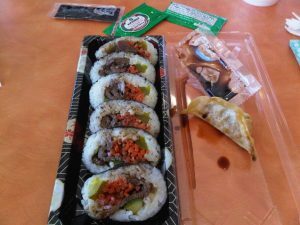 The main difference seems to be that the Korean version features cooked meats and veg; my daughter said that her roll was very good. 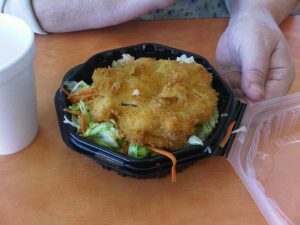 I had the Asian bowl, rice and greens topped with a piping-hot chicken cutlet.There are more authentic Korean restaurants in town, I am sure – but Tiger Pop just has that happy sense of adventure – enough that one of the items on the menu is a Korean beef taco. Only in San Antonio, eh?